Many people experience dental problems that not only affect the way they look, but that also have a significant impact on the basic function of their teeth. Restorative dentistry offers effective treatment options to help you improve a number of dental issues, particularly those caused by missing teeth. At Pomerado Cosmetic Dentistry, our experienced dentists offer comprehensive restorative dental treatments that can replace missing teeth, improve chewing and speaking, prevent further damage to surrounding tooth structure, and treat cavities and decay with successful results. Our options are custom-designed to provide you with the most precise and comfortable outcome. From dental implant restorations and fixed bridges, to partial and full sets of dentures, we can help you meet your needs while creating results that look and feel natural. Please follow the links below for more detailed descriptions of our restorative dentistry procedures, and contact us today to schedule an appointment. Searching for a way to replace one or more missing teeth? 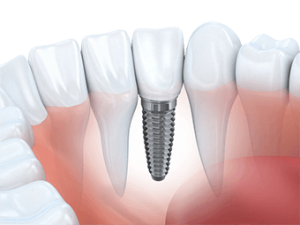 Our practice offers dental implants that are secured into place with a titanium post and affixed with a customized porcelain crown. These treatments are designed to provide you with a solution for missing teeth that both looks, functions, and feels natural. Dental implants are custom-made for the best possible fit and appearance. They do not move or slip along the gums and require no additional maintenance other than regular brushing and flossing. If you are not a candidate for dental implants, dentures can often be a good alternative for replacing missing teeth. Once you have met with our Poway dentists, we can help find a denture option to meet your specific needs. We offer both full and lower dentures composed of either porcelain or plastic teeth to provide you with effective results. At Pomerado Cosmetic Dentistry we pride ourselves on providing our patients with effective procedures that can create beautiful teeth. One way we accomplish this is by using only tooth-colored material for our fillings. This durable composite material is free of mercury so that it can blend amongst the other teeth for a more natural appearance. If you have ever felt embarrassed to smile because of a damaged or missing tooth, our experienced team at Pomerado Cosmetic Dentistry can help. We can restore the form and function of your tooth so that you can smile with confidence. 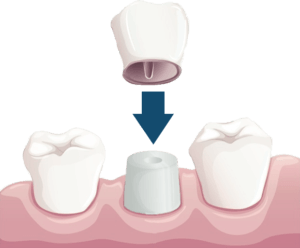 Porcelain dental crowns are typically utilized in dental implant procedures and root canal therapy; however, they are also beneficial for teeth that need additional support and protection for a large filling or to restore teeth affected by chips and cracks. Dental crowns are custom-designed for the best possible fit and are color-matched to surrounding teeth for a natural appearance. Decay can easily find its way into the grooves of teeth. Most often, decay can make its way into the back molars, causing a significant amount of damage. Our inlays and onlays procedure is designed to protect and prevent bacteria and plaque from building up on the teeth. During this procedure, we use a durable material to help reinforce the tooth. If you are especially prone to cavities, this treatment could be ideal for you. Inlays and onlays can also be beneficial for teeth affected by small cracks or fractures, helping to seal the area and reduce the risk of bacterial invasion. For more information about our restorative dentistry treatments, or if you would like to schedule a consultation, please contact our office today.